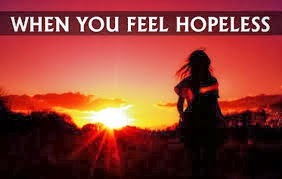 Whether hopeful or hopeless, be happy! If being hopeless makes you peaceful, be hopeless. What’s important is that you be at peace with yourself! Yesterday a reader wrote to me saying she didn’t want to be hopeful about her Life anymore. She said she had made peace with her miseries. I did not disagree with her. If she is peaceful, even while she’s ostensibly in a lot of pain, that’s what matters the most. It is wrong to assume that people can’t have a truck with their problems. Always, that’s how acceptance comes. 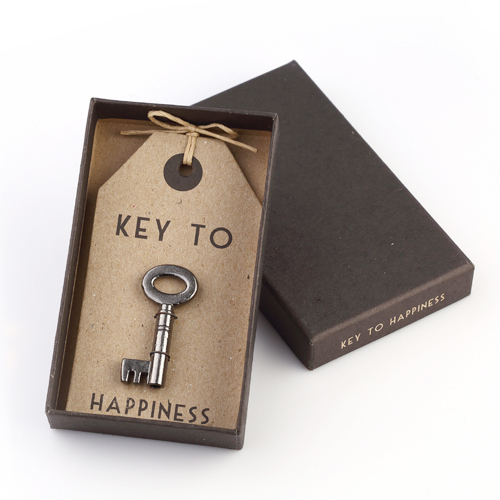 But the key is that you must be happy accepting your Life the way it is. If you are not happy, if you are not at peace, then such acceptance is, virtually, no acceptance. An intrinsic effect, an outcome, of acceptance is that it puts an end to all your suffering. The pain continues to be there. But the suffering ceases. If you are still suffering then you have not accepted your situation fully, you are still grudging it. I have found that being hopeless is not a bad thing to do – as long as you don’t sulk, brood and become depressive. 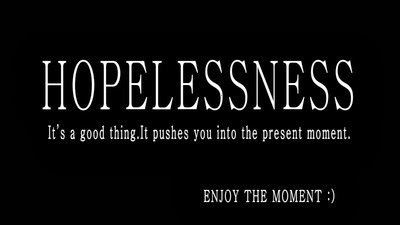 Hopelessness is nothing but acceptance. You reach a state when you decide that things are going to be the way they are and you can’t do anything but endure the Life you have. So, if this is the state in which you find inner peace, then it is completely irrelevant whether you call it hopelessness or acceptance! But there’s a caveat here – don’t complain or grieve about your situation. Just learn to cope with it and live with it. You of course can continue to work on trying to solve your problems, but with acceptance and not with resentment! Now, whether you accept a situation or not, whether you are hopeful about Life or not, your Life will change over time. Everything changes. And every situation passes on. What comes, goes away. And something new comes in its place, to soon go away. Hope and hopelessness are human inventions. They are mere labels we stick on otherwise listless events and circumstances. Think about it: if you are likely to get what you want, you are hopeful; and if you are unlikely to get what you want, you are hopeless. But neither your wanting something, or resenting something, is going to stop whatever is coming your way. 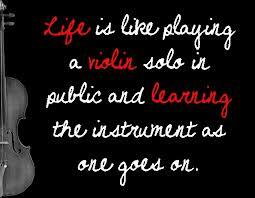 This is how Life works – it has a mind of its own and it keeps on happening to you, irrespective of how you feel. So, why label situations as hopeful or hopeless – and sweat over either? Just go with the flow, living with what is. But if you can’t avoid labeling, live with the label too – like the reader who wrote in yesterday. Whatever you do, be at peace with yourself, with your Life, and, important, be happy! Author AVIS ViswanathanPosted on March 5, 2016 March 14, 2016 Categories Acceptance, Art of Living, Hope, Hopelessness, http://schemas.google.com/blogger/2008/kind#post, Inner Peace, Intelligent Living, SufferingLeave a comment on Whether hopeful or hopeless, be happy! Go beyond hope and hopelessness, go take action! When there is no hope, remember, you are still alive. And as long as you are there, the ‘God’ within you too is alive, kicking and capable of a miracle. Most often, hopelessness leads you to conclude that it is all over. That you are finished. You miss something very crucial at that time, that all your data points, all the evidence, that you use to arrive at that conclusion, are external. They lie outside of you. Your prayers also are to reference points outside you __ a ‘God’, as in an idol in a faraway temple, or in a sacred church, or at a distant dargah! When you find that your efforts to seek a miracle for yourself are reduced to a naught, you amplify your conclusion and say, nothing is possible. You resign. You give up. 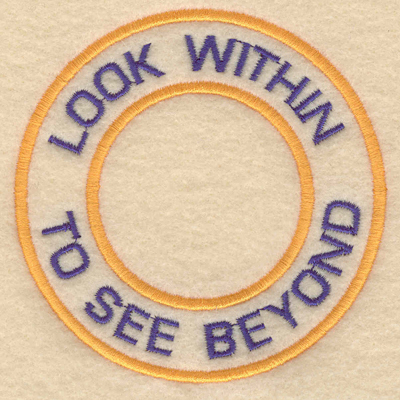 In all this time, even for a moment, you have not looked within. You have not realized the blessing of your being alive. There’s a famous saying, “With God anything’s possible!” That ‘God’, that miraculous energy, is what’s powering you. The fact that you can conclude, basis external reference points, that you are finished, is proof that you are alive. If you are alive, that Universal energy is powering you. Dip into that energy. Go within. You will then realize the futility of benchmarking all your wants and needs on external reference points. On 30th August 2012, we had to pawn Vaani’s last piece of jewelry – her thali(a gold chain, the equivalent of a wedding ring in South-Indian culture) – to raise cash for us to survive as a family. As we did that, I remember telling ourselves that “after this effort, when this cash dries up, we are on love and fresh air”. We had nothing more of value to liquidate to raise any more cash. The 30-odd months that followed saw us being roasted, as a family, over the hot coals – with zero income and zero cash on many, many, many occasions – but both Vaani and I never lost hope – not in ourselves, not in humanity, not in the Universe. It’s over 3 years now, since that day, and we have still not recovered from our 8-year-old fragile, bankrupt, insolvent situation (To know more about this story please read ‘Fall Like A Rose Petal – A father’s lessons on how to be happy and content while living without money’; Westland, August 2014; available to order on this Blog). But we have survived. And we have survived only because Vaani and I believed, deep within us, that we would. This experience has taught us that hopelessness is a wasteful emotion. To live through any crisis you just need to be aware of your being alive! With this awareness try and understand how you are feeling at the moment. If you are sad, accept that reality. If you are fearful, accept it too. If you are anxious, again accept it. Whatever you feel, acknowledge it, accept it. Then ask yourself, what can I do to change this reality? List down your actions that you can take to leverage your being alive. Some of them may be painful, uncomfortable actions. But if you have to do them, you have to. Because you want to change how you feel, right? With the actions you take, the problems you face, that led to a state of hopelessness in the first place, may not immediately go away. But if you are feeling good about what you are doing, you can be sure that you will walk into a new reality. Every new journey starts with a first step. That first step is to change the way you are feeling about whatever’s your current reality. You may not be able to see your destination yet, but if you have sat in the plane, fastened your seat belt and have closed your eyes, you can be assured the pilot will take off, and with the available data on probability, chances are good that you will land where you intend to in some time. To be sure, both hope and hopelessness are imposters. One tricks you to imagine that all will be fine. It breeds inertia. And the other deceives you and tells you it’s all over, nothing’s possible. Again it breeds inertia. Whereas visiting the energy that powers you, you feel rejuvenated, inspired and begin to act. Inertia can never get you started. Only action can. Author AVIS ViswanathanPosted on November 19, 2015 March 14, 2016 Categories Action, Art of Living, Fall Like A Rose Petal, Happiness, Hope, Hopelessness, Inner Peace, Intelligent Living, Westland BooksLeave a comment on Go beyond hope and hopelessness, go take action! Hopelessness and inertia can never transform your reality. Only action can. When there is no hope, remember, you are still alive. And as long as you are there, the God within too is alive, kicking and capable of a miracle. Most often, hopelessness leads you to conclude that it is all over. That you are finished. You miss something very crucial at that time, that all your data points, all evidence, that you use to make that conclusion, are external. They lie outside of you. Your prayers also are to reference points outside you __ a God as an idol in a faraway temple, or one in a sacred church, or at a distant dargah! When you find that your efforts to seek a miracle for yourself are reduced to a naught, you amplify your conclusion and say, nothing is possible. You resign. You give up. In all this time, even for a moment, you have not looked within. You have not cared to look at your soul. You have not realized the blessing of your being alive. There’s a famous saying, “With God anything’s possible!” That God, that miraculous energy, is what’s powering you. The fact that you can conclude, basis external reference points, that you are finished, is proof that you are alive. If you are alive, that Universal energy is powering you. Dip into that energy. Go within. You will then realize the futility of benchmarking all your wants and needs on external reference points. 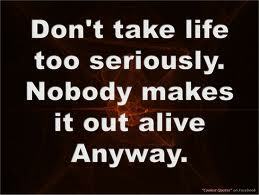 To live __ you just need to be aware of your being alive! With this awareness try and understand how you are feeling at the moment. If you are sad, accept that reality. If you are fearful, accept it too. If you are anxious, again accept it. Whatever you feel, acknowledge it, accept it. Then ask yourself, what can I do to change this reality? List down your actions. Some of them may be painful, uncomfortable actions. But if you have to do them, you have to. Because you want to change how you feel, right? With the actions you take, the problems you face, that led to a state of hopelessness in the first place, may not immediately go away. But if you are feeling good about what you are doing, you can be sure that you will walk into a new reality. Every new journey starts with a first step. That first step is to change the way you are feeling about whatever’s your current reality. You may not be able to see your destination yet, but if you have sat in the plane, fastened your seat belt and have closed your eyes, you can be assured the pilot will take off, and with the available data on probability, chances are good that you will land where you intend to in some time. Both hope and hopelessness are imposters. One tricks you to imagine that all will be fine. It breeds inertia. And the other deceives you and tells you it’s all over, nothing’s possible. Again it breeds inertia. Whereas, by visiting the energy that powers you, you can feel rejuvenated, inspired and begin to act. Hopelessness and inertia can never transform your reality. Only action can. Author AVIS ViswanathanPosted on March 1, 2015 March 14, 2016 Categories Art of Living, Current Reality, Hope, Hopelessness, Inertia, Inner Peace, Intelligent Living, TransformationLeave a comment on Hopelessness and inertia can never transform your reality. Only action can. To be hopeless about a situation in Life is, after all, not a bad thing. It helps you gain great clarity about living Life – fully, in the now! This lady’s experience teaches us something invaluable. It helps us understand that while hope is a good thing, in certain situations in Life, it may hold us hostage and blind us from seeing reality. Reality, however, cannot be escaped. So, while you live through certain unchangeable phases with unalterable realities in Life, being hopeful in a hopeless situation can indeed make you feel miserable. Your intelligence will tell you what the reality is. But hope will make you delusional – vainly wishing that the reality did not exist. This conflict will cause you to suffer – day in and day out. There’s a way to break this jinx. And that way is to simply accept a situation to be hopeless – when it really is so. For instance, if you lose someone to death – it’s pointless to hope for that person to come alive. Or if someone loses their limbs or eyesight or hearing or speech – it is futile to hope that it will be restored without a specialist medical intervention or, perhaps, a cosmic miracle! Hopelessness is not about giving up. It need not only be about feeling desperate or despondent. It can, if you allow it to, help you see the reality as it is and can teach you how to face it. For, whenever you are hopeless about some situation, you can always ask yourself “what does this mean” and “what must I do now”. The answers you get for these questions can inspire to move on, in acceptance, and in peace. To be hopeless is a great boon, an opportunity – use it! We often come across situations where there is no hope. In such times, what stares at us is a wall or complete darkness. Fear and insecurity in such situations is a natural response. But the moment fear takes over, any chance of you coming out of that situation are eroded. So, even as fear lurks around, choose your hopelessness to remain focussed in the now, in the present. No it is not difficult. If you understand hope you will be able to understand what hopelessness truly means. Hope is an aspiration of a future which is yet to arrive. So, when you are hopeless, it really means you see no future. Which therefore only means that, since the past is over and the future doesn’t exist, what you are left with is the present moment. Which is why hopelessness is an opportunity to live in the present moment. For when you have nothing to look forward to, then you can only live from moment to moment. Having lived this way for months and years now, let me tell you, it is a beautiful, awakening, humbling experience. Because you witness how magically Life goes on, without you controlling any of the influences – particularly, money, food, clothing and shelter – that you have been conditioned to believe are key to living. Hopelessness is still a desire. When you are pining that there be hope. And when with your human mind and vision you can’t see one, you despair, but even then, from deep within your heart, you continue to hope. Which means you expect a change in the situation. But true awareness is when you have transcended expectation, desire, hope, hopelessness and are simply with Life, living in the now. That’s when you have given up expecting anything from Life. And you simply are.